Patients with spinal injuries should be immobilised and have their spines imaged. Immobilisation includes cervial spine hard collar with blocks, spinal board and log rolling. This MUST be continued until the spine has been cleared or stabilised. Often both CT and MRI are required to determine the extent of complex injuries of the spine. 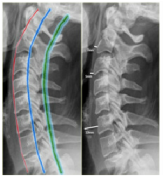 The images should be reviewed by spinal or neuro surgeons to determine the best management plan for the patient. disruption), fusion or immobilisation with specialised collars or braces. deformity, neurological deficit, spinal canal compromise of > 50% or > 50% loss of anterior column height are indications for surgical stabilisation. Other injury patterns including fracture-dislocations and flexion-distraction injuries are routinely treated with surgical stabilisation. functioning dermatome and motor level (with a minimum of ‘fair’ motor power). Cord injury occurs due to contusion and compression with resultant ischaemia at the time of a fracture or dislocation of the spine. Incomplete lesions include the central and anterior cord syndromes, Brown-Sequard syndrome and single nerve-root lesions. 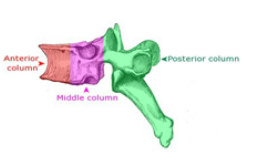 for incomplete lesions with persistent compression, which may lead to an improvement in level. Spinal fusion may be utilised to speed rehabilitation and prevent progressive deformity at the fracture level. Rehabilitation is dependent on the level of cord injury and requires input from a multidisciplinary team including physicians, surgeons, physiotherapists and occupational therapists. Scenario: called to A&E to assess a 19 year old man who was involved in a high speed RTA. - at C2 no more than 7 mm. - at C3 and C4 no more than 5 mm. - at C6 it is wider due to esophagus and cricopharyngeal muscle, but should not exceed 22 mm in adults or 14 mm in children younger than 15 years. Commonest fragility # (osteoporosis). Usually low energy injury.